There’s a lot more going on than the budget. The site now have more issue pages than ever. Learn how PBPC fought hard to close corporate tax loopholes. Get the facts on education funding, enrollment, and school poverty. Understand better what the Affordable Care Act means for Pennsylvania. Find the latest figures on employment in the commonwealth. And, yes, there is a lot on the state budget, too. Webinars, really? Yes, PBPC does webinars, and now you can find them along with our latest commentaries, press releases, news clips, videos, and podcasts at our expanded Media Center. Now where did I place that budget analysis? 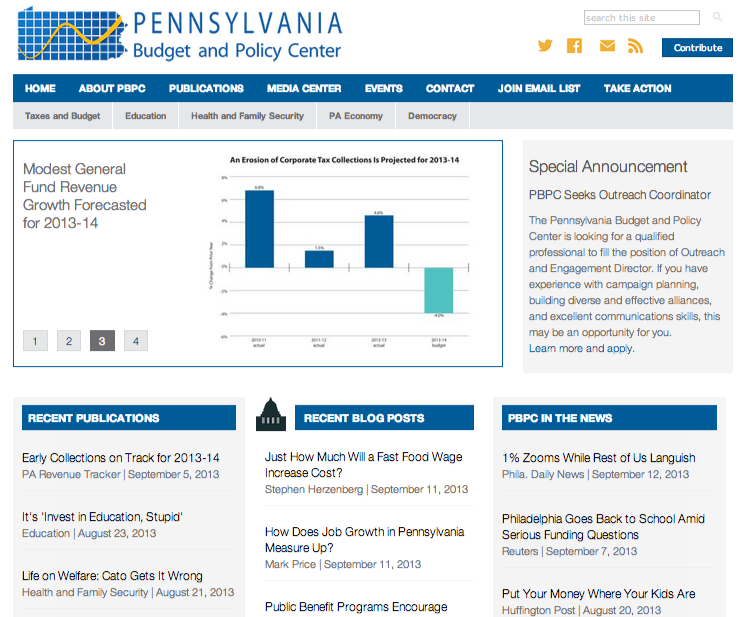 PBPC's new Publications Page allows you to easily find past budget analyses, revenue trackers, briefing papers, legislative testimony, presentations, blog posts, and much more. You can even sort posts by month and year. Get to know us better. There is an expanded “About PBPC” section. Learn about our history, who our partners are, job and internship opportunities, how to request a speaker, where to make a donation, and much more. The web site is new, but the URL has not changed. Pennsylvanians can still find the center online at www.pennbpc.org.